Can't load lump 53, allocation of 17411653 bytes failed!!! Was playing the game and then it crashed and displayed that box - what does it mean? I see this is an HDR issue (lump 53). Will turn if off and see if that works. If it helps it was on the section just after loading when you are on the freight transporter just after launching the missile. I ran into the same error after being killed by the helicopter on the dam. I had the game crash with the same error message after being killed by the helicopter on the dam. 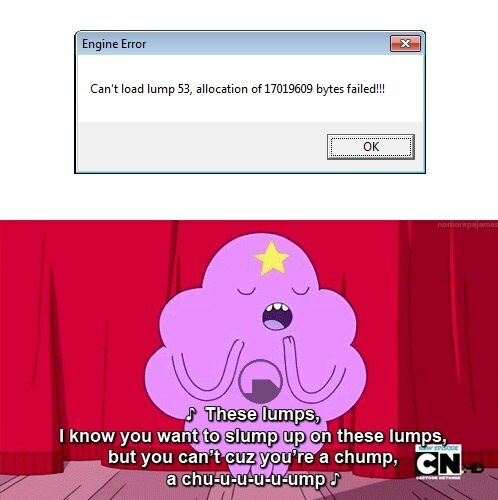 It read “Can’t load lump 29, …” and had a different number of bytes. I just had this issue as well, I just got down the damn and was about to head in to the pipes and it crashed. I’m assuming it’s a memory leak to do with saves as well as it was probably saving at that point. What are each of you using as your O/S and video card? Windows 7 64-bit with two GTX 670s in SLI. 8GB of DDR3 and an i7 870 as well if that helps. I’ve seen reports of changing the texture details to ‘high’ instead of ‘very high’ having solved the problem. I also have this issue, three or four times by now, and last when killed by the copter on the dam (underwater). Win 7 sp1 x86, 2gb ddr2, intel q6600 quad-core, MB MSI P45 Neo2, GeForce 8800GT.